Learn about the Bichon Frise’s history, diet, and health to discover what makes this breed unique! The Bichon Frise is thought to have originated on the Island of Tenerife in the Mediterranean and taken to mainland Europe by traders. The laid-back personality and teddy bear look of this breed meant that they were soon popular with the wealthy in society where they were pampered. The Bichon breed is smart and well-balanced with a broad, muscular body and straight limbs. It also has a natural white coat of soft corkscrew curls and a tail raised up and curling over the back. 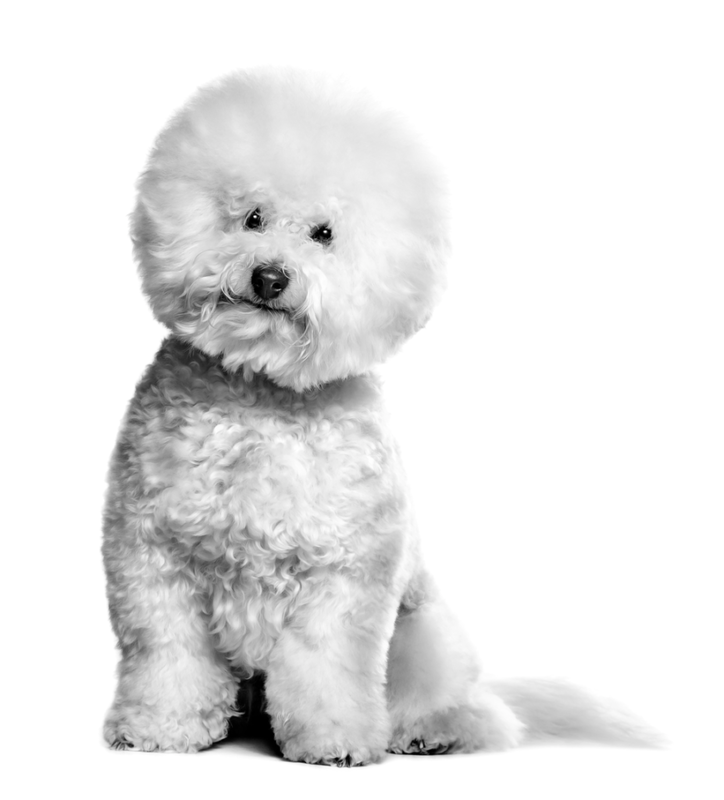 It is ideal to ensure that your Bichon’s grooming (including Bichon brushing) takes place on a weekly basis to properly maintain its skin health and coat condition to keep its curls in full flow! The Bichon Frise also has characteristic dark round eyes and a large, round black nose. Bubbly and sociable, the Bichon is happy to be included in any activity. They are affectionate and laid-back, which has led to their growing popularity as a family pet. The Bichon Frise puppy takes 10 months to reach adulthood, and during this short, rapid growth period, a diet which will meet all their energy and nutrient needs is preferred – one that supplies quality protein and a balance of minerals. During this time, the Bichon puppy will also be growing its distinctive coat – which will need specific amino acids and omega fats for it to fulfil its potential. The digestive system and natural defences will also be developing, and they will benefit from additional support in terms of antioxidants and prebiotics. The Bichon adult can be prone to weight gain, meaning that they can benefit from a diet with a more moderate calorie content than many other small breeds. Excess weight can contribute to many health concerns, including urinary issues – small breeds in particular are susceptible to this. Therefore, a diet which takes urinary health into concern is ideal. The Bichon is known for its white curly coat which, as noted earlier, requires regular grooming. A diet which contains quality protein and a supply of selected vitamins, minerals and omega fats will also help to support the health of the skin and coat – in conjunction with proper grooming. Ideal adult Bichon Frise food: ROYAL CANIN® Bichon Frise Adult.